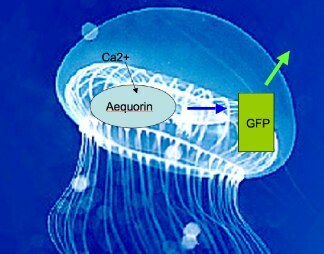 Intermolecular energy transfer between aequorin and GFP in jellyfish (4,5) and when co-absorbed on Sephadex column. (5) See Figure below. Posttranslational oxidation of S65T GFP four times faster than wt-GFP. (13) The origin of enhanced GFP (EGFP). Red fluorescent proteins (DsRed) discovered in anthozoan corals. (19) Leads to discovery of many new fluorescent proteins and chromoproteins. GFP tolerates insertion of entire proteins in certain locations and can be circularly permuted. The Olympus web-site has a java tutorial that shows how the DsRed chromophore is formed. Check it out. Monomeric DsRed (mRFP) (22), first photoconverible (Kaede (23,24), and photoactivatable (PA-GFP (24)) FPs created. New "fruit" FPs generated by in vitro (26) and in vivo (27) directed evolution. (1)	D Davenport, JAC Nicol: Luminescence of hydromedusae. Proc. R. Soc. London, Ser. B 144 (1955) 399-411. (2)	O Shimomura, FH Johnson, Y Saiga: Extraction, purification and properties of aequorin, a bioluminescent protein from the luminous hydromedusan, Aequorea. J. Cell. Comp. Physiol. 59 (1962) 223-29. (3)	JW Hasting, JG Morin: Comparative biochemistry of calcium-activated photoproteins from the ctenophore, Mnemiopsis, and the coelenterates Aequorea, Obelia, Pelagia and Renilla. Biol. Bull. 137 (1969) 402. (4)	JG Morin, JW Hastings: Energy Transfer in a bioluminescent system. J. Cell Physiol. 77 (1971) 313-18. 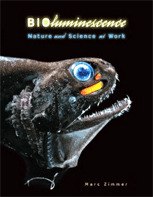 (5)	H Morise, O Shimomura, FH Johnson, J Winant: Intermolecular Energy Transfer in Bioluminescent systems of aequorea. Biochemistry 13 (1974) 2656-62. (6)	O Shimomura: Structure of the chromophore of Aequorea green fluorescent protein. FEBS Letters 104 (1979) 220-22. (7)	D Prasher, RO McCann, MJ Cormier: Cloning and Expression of the Cdna Coding for Aequorin, a Bioluminescent Calcium-Binding Protein. Biochemical and Biophysical Research Communications 126 (1985) 1259-68. (8)	DC Prasher, VK Eckenrode, WW Ward, FG Pendergast, MJ Cormier: Primary structure of the Aequorea victorea green fluorescent protein. Gene 111 (1992) 229-33. (9)	CW Cody, DC Prasher, WM Westler, FG Pendergast, WW Ward: Chemical Structure of the hexapeptide chromophore of the Aequorea Green fluorescent protein. Biochemistry 32 (1993) 1212-18. (10)	M Chalfie, Y Tu, G Euskirchen, WW Ward, DC Prasher: Green fluorescent protein as a marker for gene expression. Science 263 (1994) 802-05. (11)	S Inouye, F Tsuji: Evidence for redox forms of the Aequorea green fluorescent protein. FEBS Letters 351 (1994) 211-14. (12)	R Heim, DC Prasher, RY Tsien: Wavelength mutations and posttranslational autoxidation of green fluorescent protein. Proc. Natl. Acad. Sci. USA 91 (1994) 12501-04. 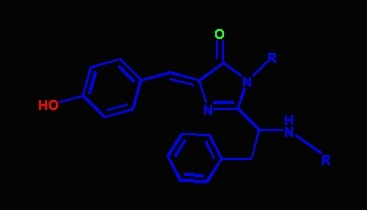 (13)	R Heim, A Cubitt, RY Tsien: Improved green fluorescene. Nature 373 (1995) 663-64. (14)	M Ormo, AB Cubitt, K Kallio, LA Gross, RY Tsien, SJ Remington: Crystal structure of the Aequorea victoria green fluorescent protein. Science 273 (1996) 1392-95. (15)	F Yang, LG Moss, GN Phillips: The molecular structure of green fluorescent protein. Nature Biotechnology 14 (1996) 1246-51. (16)	A Miyawaki, J Llopis, R Heim, JM McCaffrey, JA Adams, M Ikura, RY Tsien: Fluorescent indicators for Ca2+ based on green fluorescent proteins and calmodulin. Nature 388 (1997) 882-87. (17)	A Miyawaki, O Griesbeck, R Heim, RY Tsien: Dynamic and quantitative Ca2+ measurements using improved cameleons. Proc. Nat. Acad. Science 96 (1999) 2135-40. (18)	K Brejc, TK Sixma, PA Kitts, SR Kain, RY Tsien, M Ormo, SJ Remington: Structural basis for dual excitation and photoisomerization of the Aequorea victoria green fluorescent protein. Proceedings of the National Academy of Sciences of the United States of America 94 (1997) 2306-11. (19)	MV Matz, AF Fradkov, YA Labas, AP Savitisky, AG Zaraisky, ML Markelov, SA Lukyanov: Fluorescent proteins from nonbioluminescent Anthozoa species. Nature Biotech. 17 (1999) 969-73. (20)	A Terskikh, A Fradkov, G Ermakova, A Zaraisky, P Tan, AV Kajava, XN Zhao, S Lukyanov, M Matz, S Kim, I Weissman, P Siebert: "Fluorescent timer": Protein that changes color with time. Science 290 (2000) 1585-88. (21)	LA Gross, GS Baird, RC Hoffman, KK Baldridge, RY Tsien: The structure of the chromophore within DsRed, a red fluorescent protein from coral. Proceedings of the National Academy of Sciences of the United States of America 97 (2000) 11990-95. (22)	RE Campbell, O Tour, AE Palmer, PA Steinbach, GS Baird, DA Zacharias, RY Tsien: A monomeric red fluorescent protein. Proceedings of the National Academy of Sciences of the United States of America 99 (2002) 7877-82. (23)	H Mizuno, TK Mal, KI Tong, R Ando, T Furuta, M Ikura, A Miyawakil: Photo-induced peptide cleavage in the green-to-red conversion of a fluorescent protein. Molecular Cell 12 (2003) 1051-58. (24)	GH Patterson, J Lippincott-Schwartz: A photoactivatable GFP for selective photolabeling of proteins and cells. Science 297 (2002) 1873-77. (25)	DM Chudakov, VV Belousov, AG Zaraisky, VV Novoselov, DB Staroverov, DB Zorov, S Lukyanov, KA Lukyanov: Kindling fluorescent proteins for precise in vivo photolabeling. Nature Biotechnology 21 (2003) 191-94. (26)	NC Shaner, RE Campbell, PA Steinbach, BNG Giepmans, AE Palmer, RY Tsien: Improved monomeric red, orange and yellow fluorescent proteins derived from Discosoma sp red fluorescent protein. Nature Biotechnology 22 (2004) 1567-72. (27)	L Wang, WC Jackson, PA Steinbach, RY Tsien: Evolution of new nonantibody proteins via iterative somatic hypermutation. Proceedings of the National Academy of Sciences of the United States of America 101 (2004) 16745-49. (28)	D Shcherbo, EM Merzlyak, TV Chepurnykh, AF Fradkov, GV Ermakova, EA Solovieva, KA Lukyanov, EA Bogdanova, AG Zaraisky, S Lukyanov, DM Chudakov: Bright far-red fluorescent protein for whole-body imaging. Nature Methods 4 (2007) 741-46. (29)	DD Deheyn, K Kubokawa, JK McCarthy, A Murakami, M Porrachia, GW Rouse, ND Holland: Endogenous green fluorescent protein (GFP) in amphioxus. Biological Bulletin 213 (2007) 95-100. (30)	FHC Wong, DS Banks, A Abu-Arish, C Fradin: A molecular thermometer based on fluorescent protein blinking. Journal of the American Chemical Society 129 (2007) 10302. 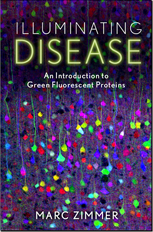 (31)	NC Shaner, GH Patterson, MW Davidson: Advances in fluorescent protein technology. J Cell Sci 120 (2007) 4247-60. (32)	AS Mishin, FV Subach, IV Yampolsky, W King, KA Lukyanov, VV Verkhusha: The first mutant of the Aequorea victoria green fluorescent protein that forms a red chromophore. Biochemistry 47 (2008) 4666-73. (33) MC Gather, Sh Yun: Single-cell biological lasers, Nature Photonics, 2011/06/12/online, advance online publication.